I'm one of those people that tend to get caught up in things that are right in front of me, especially this time of year when there is a lot of things. As a work from home mom, it can be all too easy to go for days just focusing on work projects, my yoga practice, running a house and you know.... raising humans. I can keep it all humming like clockwork until a spring comes lose. It may show up as restlessness for me, but more often its sadness and an overwhelming feeling of disconnect. Through great introspection and slowing the f--- down, I'm realizing that one of my energy sources (perhaps the greatest one) is connection. Loving and genuine connection with family and friends is something that I crave all the time, without even realizing it. Unloading the dishwasher in record time may give me a sense of victory, but sitting down with my husband and having a meaningful conversation or a real hug fills me up in ways that are hard to express. My memory of sitting with a friend recently, looking out over open water, and listening to her open her heart still brings me to tears. Looking into the eyes of new friends, and knowing that they really see me means more than I can even say. All of this leads up to the seemingly insignificant concept of family dinner. In my household this has been an elusive concept for quite a long time now. My children all seem to be going in different directions most days, I prefer to eat early, and my husband usually doesn't even walk through the door until 8PM on a good day. Somewhere along the line, I set the idea of sitting together as a family, and this huge potential point of connection for all of us, to the side. After a deeply impactful wellness retreat this past weekend (more on that soon), I decided that it's high time to bring back family dinner. Not try to bring it back. Bring it back -- full stop. I own my intention that I need this source of energy and likely my family does too. So, I got about the task of manifesting it, and was able to get everyone around the table - even earlier than I had thought. The meal may not have been Instagram-ready (but it was damn good), my husband may have walked in the door the minute we were sitting down to eat -- but it happened. We had about 30 minutes of conversation with our children. No screens or devices. We all looked each other in the eye. We all shared things that made us happy and grateful that day. 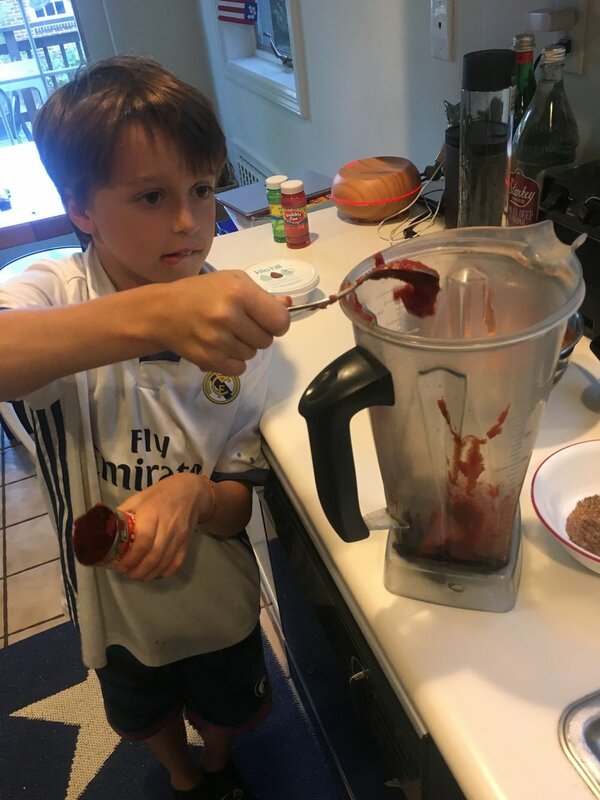 My husband and I learned new things about our sons' school experience and had the chance to relish and marvel at this little tribe we've created. It may sound cliché, but it truly set the tone for the week. 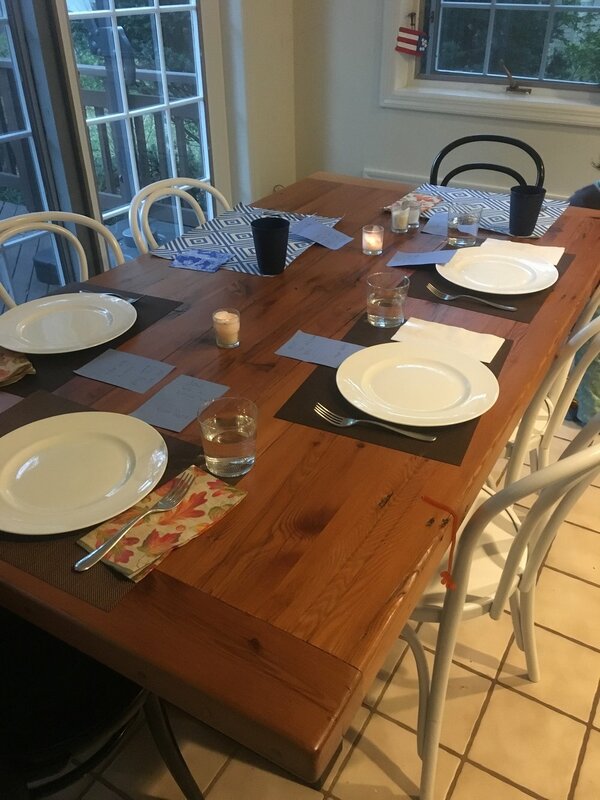 Despite the kids' grumbling about having to wait a little bit for dinner, and maintain focus for a bit longer than usual -- I could tell they sensed how special it was. I came away with a feeling of joy. Not an ecstatic kind of joy, but a deep and grounding sense of well-being. These are the moments and experiences that matter to me. My intention is to make this a weekly event. I will give myself grace on the weeks we can't pull it off, but going forward, this is one energy source I plan to remember and cherish for as long as I can. Here is the recipe that we had for our family dinner. It comes from an absolutely lovely (and accomplished) chef - Laura Lea Balanced. My son helped with the preparation, set the table and even created little "love notes" for everyone. PS: It was a bit time consuming, and I'd recommend preparing the components in advance. Next time, that's exactly what I plan to do. Finally - how do you connect with your family? I'd love to hear!